The scenes featuring Gloria in “The Lost Weekend” are said to be shot in PJ Clarke’s bar, still at the corner of Third and 55th, but no longer under the shadow of the El. It was not “New York’s New Yorkiest” joint, however, as declared by Walter Winchell, the leading radio personality of the 1940s and 1950s. That honor fell squarely on The Stork Club. Unlike PJ Clarke’s unfortunately, nothing is left today of The Stork. Owner Sherman Billingsley was arguably one of New York’s greatest celebrities from the 1940s and 1950s. Where he once fought union pickets and sabotage, while throwing customers out (who dared to patronize the rival Harwyn club), a peaceful pocket park marks the former location of the famous glitzy eatery and bar. There aren’t that many relics of old New York left. Probably one of the best “New Yorkiest” venues still in existence is the storied Cooper Union for the Advancement of Science and Art. It’s a puzzling institution in that many New Yorkers don’t seem to know about it. When I asked my Dad where he went to college, he told me proudly “Cooper Union” and when he noticed my quizzical look, proceeded to tell me about it. It’s one of the most selective private colleges in the United States based on the strength of its academics and the fact that every student receives a scholarship equal to 50% of the tuition (it was 100% until 2014). The engineering, art, and architecture curricula are all very highly reputed. Inspired by the École Polytechnique in Paris, it was founded by Peter Cooper in 1858. On February 27, 1860, the school’s Great Hall, located in the basement level of the Foundation Building, became the site of an historic address by Abraham Lincoln. Abraham Lincoln’s dramatic speech opposed Stephen A. Douglas on the question of federal power to regulate and limit the spread of slavery to the federal territories and new States. Widely reported in the press and reprinted throughout the North in pamphlet form, the speech galvanized support for Lincoln and contributed to his gaining the Party’s nomination for the Presidency. 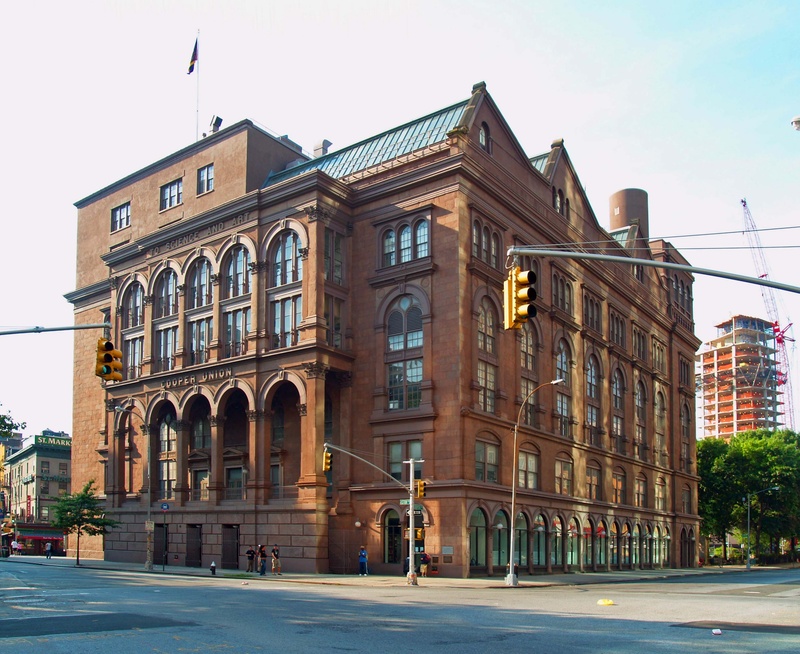 It is now referred to as the Cooper Union Address. The Foundation Building, Cooper Union. In spite of this, Cooper Union has a quieter profile than expected for a school of such selectivity. For one thing, this highly specialized school concentrates in only three disciplines. As such, the student body is extremely small – almost 250 total for all three schools! My boarding high school was more than three times larger! To some extent, the Union also has a reputation as a commuter school since only freshman are offered space in the adjacent student residence. But a significant percentage of the student body comes from outside the NYC region. 41 Cooper Square. The new building. I met recently with Catherine Sanso, a recent graduate of the Union. As part of the Alumni Association, she was writing a story about the man for whom this blog is named at the time. While we chatted over croque monsieurs and fries about Dad’s achievements – her eyes lit up in recognition when I described to her one of Dad’s proprietary processes for eliminating error. The following describes the aforementioned process in a fair amount of detail. Bear with me on this if you can; I know this thing like the back of my hand. It remains a complete innovation to the industry of patent annuities and is a shining example of a “best practice” as introduced by Bernard Olcott. Readers may wish to refer to my post “THE NEW BUSINESS OF PATENT ANNUITIES” for a refresher as to what a patent annuity payment service does and how it operates. The check-off process to be described here concerns the method by which the responsibility for an annuity payment is transferred from one payer to another. Back in the early 1960s, there was only one annuity payment service, Bernard Olcott & Associates (the precursor to Olcott International), and maybe one other, Dennemeyer, based in Luxembourg City). If payment responsibility was being shifted to Olcott International, chances were it was being shifted away from the local patent agent resident in Paris, Athens, Tokyo, or wherever. If the transfer of payment responsibility was handled in a careless or cavalier fashion, error was a distinct possibility. That could mean the lapse of patent protection due to non-payment of the annual renewal fee. Put another way, the state-granted monopoly for selling your better mousetrap was over and anyone there could make and sell your gadget for less. The value of your product, in other words, would plummet – badly. Patents are valuable (at least for products in high demand); if your client is a big business and paying for patent protection, there is likely to be an economic basis for doing so. Let’s consider that you are a patent annuity payment service and your new client has 5 patents to be paid each year in Turkey, for example. Back in the 1960s, your new client was awash with paper files, folders, and filing cabinets. Upon awarding the payment contract to you, they might very well scour all those files and prepare typewritten lists of hundreds of patent numbers. Beautiful Istanbul. Largest city in Europe! Dad was quick to point out that this manual process had an unacceptable rate of error. If the second patent number above 200185501 was actually 200185901 on the books at the Patent Office, an erroneous payment will be attempted on a wrong number. It will be rejected, while payment on the correct number will be neglected (or not made by the previous payer since they were issued a wooden instruction to no longer pay renewal fees). What you get is a dead patent. All because of your success in getting a new customer. Not very impressive, even if the probability of this error is less than 1 in 20,000! Dad introduced an adjustment to this process that served to tighten up the chain of responsibility and elevate the level of diligence. His innovation was to create what he called an “Agent’s Check-Off Schedule,” otherwise known as “Safety Net Number 1.” I grew up with this thing so bear with me for a moment. This is a much better instruction. The agent is obliged to compare the list against their own records and if they are not instructed to NOT pay the renewal fee due for 200185901, well then, they remain on the hook for it. Good logic, right? Agents were only too happy to point out that 200185501 could not be found in their records and, by the way, did the new renewal payment agency make a careless error as concerns correct patent number 200185901? In any event, the error will be detected, the payment for the correct item will be made, a valuable patent renewed, and patent records everywhere corrected. Dad’s foresight converted an error-prone manual process into an ironclad fail-safe one. In my opinion, this was a significant contribution to the profession and one that I believe is still unmatched by the competition. Any competitors out there care to differ? I was surprised to learn that the logical underpinning of the “Agent’s Check-Off Schedule” – like I mentioned earlier, I can see this thing in my sleep – was part and parcel of Cooper Union’s core curriculum! Now, I know the origin of Olcott International’s Safety Net Number 1 as a valuable lesson of diligence in process methodology! Obviously, I need to express my gratitude to Catherine for her valuable time in recalling and explaining QA/QC to me. Sometimes when you dig around, you find unexpected things. Such kind of diligent process methodology of course has great implications, far beyond the patent renewal industry. However, to my knowledge, no other patent annuity service ever implemented such a safety net. This routine was not the only “safety net” employed by Olcott International. Corporate patent owners should contact Olcott International for more information on enhancing security of their renewal portfolios at a significant cost savings. The world of Intellectual property (“IP”) is not limited to the simple renewal of patent registrations worldwide. Recently the business press has been awash with stories about patent infringement litigation such as between Apple and Samsung for example. One of my friends Peter Groves hosts an excellent blog about IP and I recommend readers with a professional interest in IP to ping it weekly. A link can be found to his IP Dictionary — check out his listing for Olcott International!